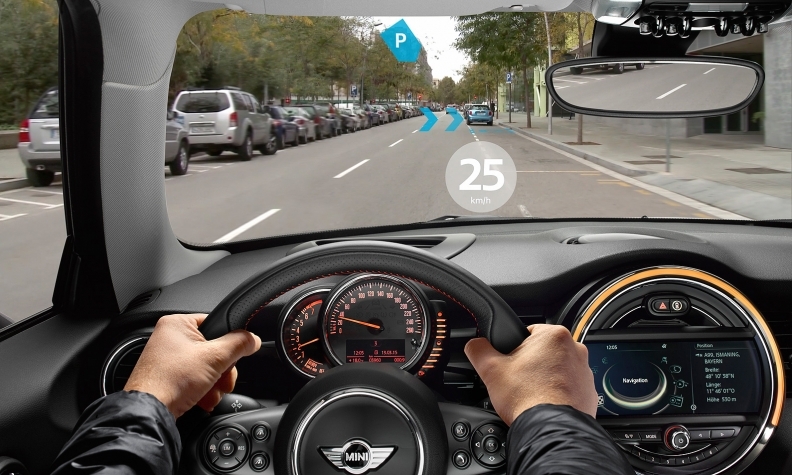 Using see-through technology, Mini eyewear shows relevant navigation and other information in the driver's direct field of vision but without concealing other road users, helping to increase safety and comfort behind the wheel. 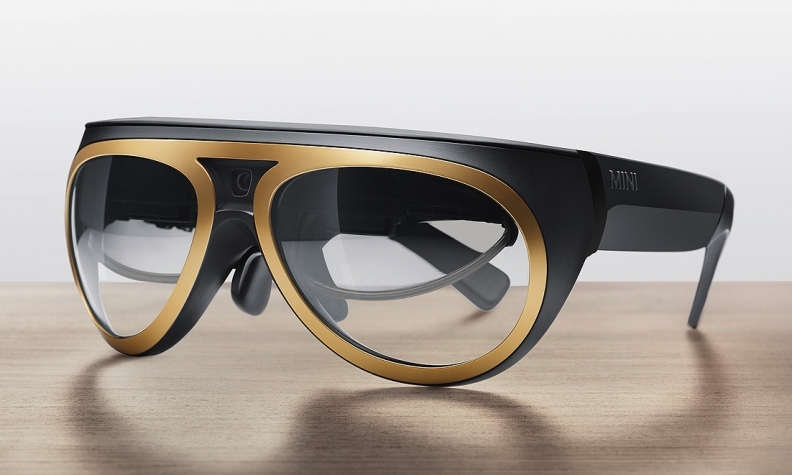 SAN FRANCISCO -- BMW Group thinks computerized headsets such as Google Glass could be the next big thing. So Sunday at the Shanghai auto show, BMW unveiled a prototype of goggles that would turn the world into a digital display, making it easier to follow navigation directions and park in a BMW or Mini. The prototype glasses, which strongly resemble old-fashioned aviator goggles, show the kind of information that’s generally found on a BMW head-up display, such as the speed limit and the vehicle speed. But they do much more. In navigation mode, the glasses project a sweeping line that tells the driver when to turn. In parallel parking mode, they tap into camera feeds from the vehicle to offer an unobstructed view of the curb, helping the driver get as close as possible without scraping the wheels. Engineers at BMW’s r&d center in Silicon Valley have worked on the project with San Diego chipmaker Qualcomm since the fall of 2013. Now they’re waiting for the industry to mature, because they’d rather write software for another company’s headset than try to build and sell a production-ready headset of their own. When the project began, BMW archrival Mercedes-Benz was working with Google to test how Google Glass could be used to help drivers get around. BMW wanted to build a headset that went a step further. Rather than merely displaying information in the corner of the driver’s eye, BMW wanted to anchor that information to reality by tracking the driver’s gaze and making the information pop up appropriately based on the location of objects in the real world. Jay Wright, a vice president at Qualcomm who oversees the company’s augmented reality business, said most components of the goggles, except the twin displays for the lenses, can be found in an ordinary smartphone. They run on Google’s Android operating system and Qualcomm’s Snapdragon 805 processor, the same one in the Samsung Galaxy S5 smartphone. Produced at scale, a pair of goggles should cost roughly the same as a high-end smartphone, Wright said. The market is still emerging. Google Inc. is working on a second-generation version of Google Glass, while Microsoft Corp. is developing an augmented reality headset called the HoloLens and Sony Corp. just started shipping a developer kit for an $840 gadget called the SmartEyeglass in March. BMW and Qualcomm had to solve some tricky engineering problems. For one: figuring out the exact position of the goggles, so the images could be pegged to the real world. They decided to write the history of the Mini brand on the headliner of the car in special ink; by looking up at the ceiling with an infrared scanner, the glasses know the exact location and angle at which they’re positioned. The driver wearing the glasses can control them by pushing a button near the right temple. While the vehicle is being driven, the glasses are synced to the vehicle. If a driver sees a prompt about an incoming text message, he can push a button on the steering wheel to have the message read aloud. Yet this is just a prototype. Setting up the glasses takes calibration; users cannot simply slip on the glasses and go. And because the images are tethered to a specific point in the real world, slight head movements can cause the digital overlays to bounce up and down, or jerk in and out of view. And there is no guarantee that customers will embrace a pair of gawky goggles. Patrick McKenna, manager of U.S. product planning at Mini, said driving goggles could avoid some of the common complaints about Google Glass. Some people may feel it’s unfashionable to have a computer strapped to their faces and that it’s impolite to interact with people while pointing a camera at them. But a car is a private place.